This is how fairy tales begin. Not with “once upon a time”, but with individuals standing on an empty stage patiently waiting to be told what to do next. Because fairy tales are essentially about the completion of tasks, even when the hero or heroine has no idea what that might lead to. The underlying moral of most fairy tales is – do as you’re told and good things will follow. Franz Xaver Von Schönwerth was a contemporary of the Brothers Grimm. Like them he collected folk tales, employing a scientific method and focusing on a specific region of Bavaria known as the Upper Palatinate. He used questionnaires and carefully recorded the dialect, customs and costumes of the people he interviewed. His work was much admired during his lifetime, but seems to have disappeared after his death. Until 2009 when Erika Eichenseer (a Bavarian author, storyteller & poet) discovered 500 unpublished works in a Bavarian archive. The Turnip Princess and Other Newly Discovered Fairy Tales translates 72 of these newly discovered stories into English. The book divides them into six categories: Tales of Magic and Romance, Enchanted Animals, Otherworldly Creatures, Legends, Tall Tales and Anecdotes and Tales About Nature. And they are quite unlike anything you might have encountered in the past. Yes, there are some familiar themes – such as dancing princesses, a miniature child (“the size of a thumb”) and enchanted toads. 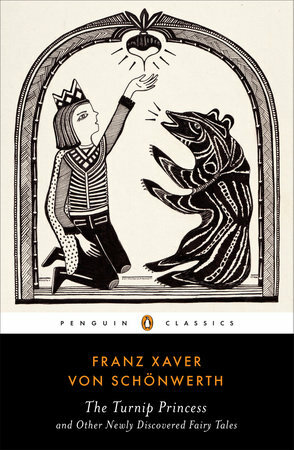 But in Von Schönwerth’s versions the Prince is often the one who needs saving; soldiers carry guns, not swords; the toad is just as likely to be a Princess and even after the hero saves the day he doesn’t always get the girl. The Three-Legged Goats, like many of the stories in this collection, appears to be a compilation of several fairy tales into one. Which makes sense when you consider that Von Schönwerth’s purpose when setting down these tales was to faithfully record the oral history of those he interviewed. These stories were transcribed in the telling – not copied from books. They changed and evolved over time. And so it’s not implausible that two or three may have eventually merged together and been condensed into one. Or that a story which began one way would end in another. This results in very different narratives than most of us are accustomed to. Maria Tatar makes some interesting choices in her translation. Three soldiers, we are told, have “finished their tour of duty”. When a huntsman asks three giants if they are planning to free a princess, the giants growl “From her wealth, anyhow.” There are more guns mentioned than I remember in The Brothers Grimm. Von Schönwerth lived from 1810-1886, so the modernity of the language and references is not entirely misplaced. But it is definitely unexpected and at times jarring – which might have more to do with my expectations of what a fairy tale is than the quality of the translation. Hans Christian Anderson, Charles Perrault, Andrew Lang (of the Blue, Red & Green Fairybooks, etc.) and Walk Disney have – for better or worse – shaped most of our expectations of what a fairy tale should be. It is easy to forget that folk tales are just another form of folk art – and that folk art is primitive by definition. The stories in The Turnip Princess range from one to five pages in length, which doesn’t leave a lot of room for embellishment. But it is the stripped-down, primitive nature – the potential in these stories of what they can become – which makes this collection so exciting. Consider the literary impact of Cinderella, Beauty & the Beast, Red Riding Hood and Hansel & Gretel. The plots & characters have become archetypal. Their influence can be detected (whether overt or subtle) in many contemporary works of fiction. What, then, might a new generation of writers make of Franz Xaver Von Schönwerth’s stories? Of a girl who becomes a snake when her stepmother casts her into a lake? Or a Prince who is kidnapped by a mermaid? Or a beautiful maiden freed from a turnip? Erika Eichenseer’s discovery has created new possibilities… new opportunities.